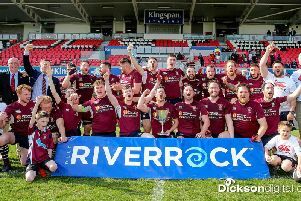 City of Derry made it six AIL wins from six games to consolidate their position at the top of Division 2B with a hard fought victory over third placed Greystones at Judges Road on Saturday. Terry McMaster’s men were missing a host of first team regulars and had to dig deep in the final minutes as the visitors set up camp inside the home ‘22 but could not find a way through the heroic home defence. This was far from Derry’s best performance of the season and both teams were guilty of passing up chances with needless loose play but in the end first half tries from Chris Cooper and Stephen Dickey as well as a brace of Andrew Semple penalties proved enough to secure the points. The visitors started well and pinned Derry back but Derry looked dangerous and following an initial break from Semple, Sam Duffy produced a superb driving run which took his team inside the Greystones ‘22. The prop was stopped short but managed to offload to the supporting Chris Copper who bundled his way over the line with Neil Burns converting for a seven point lead. Derry should have had a second try on 13 minutes but Simon Logue couldn’t gather Richard McCarter’s raking pass with the line beckoning. Craig Huey then got himself on the end of a McCarter pass and looked set to score but was stopped only two yards short, the ball eventually being knocked on to let Greystones off the hook. Greystones Blake Hill was yellow carded for deliberately knocking on as Ali Beckett tried to send Semple clear and with the extra man, McMaster’s team soon extended their advantage. Derry kicked the penalty into the corner and from the ensuing line-out, Dickey went over with Burns producing a superb kick to convert from a difficult position. The first half ended with Killian Marmion converting a Greystones penalty but Derry were in charge at 14-3. Yet the home side never really got going second half. Three minutes in, Paudie Geoghegan went over for the visitors opening try and from there Derry were on the back foot although they didn’t help themselves by continuing missing kicks to touch which would have relived pressure. Beckett should have released Burns for a Derry try on 54 minutes but dwelt too long and the opportunity was lost. With Derry rocking, a Semple penalty calmed nerves and moved the home side into a seven point lead at 17-10 but they were never convincing. However, when a brilliant Beck break could only be stopped by a high Greystone tackle, Semple’s second penalty looked to have brought some much needed breathing space. That should have been enough but Derry’s inability to hold possession or find touch when needed invited Greystones back on them and the visitors took advantage with a Conor Shiel try and Killian Marmion conversion making it a three point game at 20-17 with six minutes remaining. Those minutes were spent inside Derry’s ‘22 with Greystones throwing everything forward but each attack was met with at time heroic defence as Derry held on to maintain their excellent start. City of Derry: Rory Squires, David Ferguson, Sam Duffy, Chris Cooper, Bob McKillop, Craig Huey, Steven Dickey, Stephen Corr, Andrew Semple, Richard McCarter, Simon Logue, David Funston, Neil Burns, Neil Brown, Ali Beckett. (Replacements) Cathal Cregan, Ross Harkin, Stephen Walker, Stuart Simpson, David Graham. Greystones RFC: Conor Pearse Dean McKeon, Barry Trainor, Ryan Usher, Dan Mannion, Blake Hill, Alan Dempsey, Bobby Clancy, Jason Curran, Killian Marmion, Ferdia Kenny, Conor Shiel, Simon Malone, Paudie Geoghegan, Darragh Callan. (Replacements) Michael Douglas, Ian O’Bierne, Cormac O’Donoghue, Conor O’Rourke, David Downey.